This story first appeared in my book All The Dead Voices, which was published in 2002. Based on his diary and letters it tells of how a young Canadian soldier (and his comrades) could hardly wait to get to France and the front, and his experiences of battle. At dinner on Sunday afternoons some light music from other eras which suit the mood and my love of nostalgia play in the background. Last Remembrance Sunday many of the songs and melodies on the radio were from the two world wars: As Time Goes By, White Cliffs of Dover, Over There, My Sweetheart is Somewhere in France, and It’s a Long, Long Way to Tipperary. My wife, Leslie, went upstairs and returned with some old photographs, one in particular of a handsome young man, Private Bob (Robert) Conklin, her great uncle from Toronto, who fought with the Canadian Corps in France in 1918. She told us that her mother Sheila and Aunt Nancy still had Bob’s letters and one of his diaries. A few months later, on holiday in Toronto, I asked to see Bob’s papers, including many photographs of him and his comrades, postcards he had sent home and newspaper clippings which his family had gathered and cherished. Again, as with going through the relics of the dead in Altaghoney, I felt honoured and handled with care these precious documents. 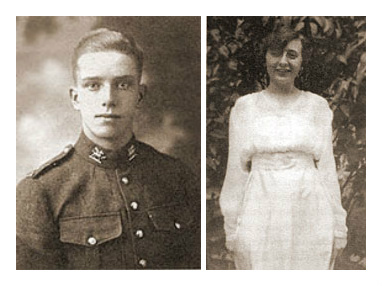 I could hear Bob’s filial voice addressing his parents, Laura and James, and his gentle advice, that of a ‘big brother’, to his younger siblings, Veny (Evelyn), Alfred Norman, Isabel and Dorothy. ‘I try to make my letters interesting when I have something to talk about or describe,’ he says in one. Bob was the eldest child in the family. He won a scholarship every year from 1910 to 1914 and at the end of the final year headed his class. He could speak some French and quote Browning, and wrote a few pieces of light-hearted verse about army life. He worked for the Merchants Bank in Toronto before enlisting in 1916 at the age of eighteen. He was in love with Isobel Howes, to whom he was engaged, jokingly referred to her as his ‘wife’, and pasted photographs of her into his diary, creating a little picture gallery. Through the Toronto Star newspaper I tried to discover if Bob’s many letters to Isobel – from Camp Borden Training Camp, from England and the western front – were still extant but learnt from one of her relatives, Alan Welch, a nephew, that Isobel’s last surviving and youngest brother, Edwin, had died just a year earlier, aged eighty eight. Alan had no recollection of any of Bob’s letters and so the trail went cold. Much of Bob’s correspondence expressed his frustration at the delay in going over to England and the monotonous training and endless drilling and marching. Then, in his diary in February 1917 he writes: ‘Lt-Col. Cooper announced to the Buffs [Canadian Buffs, 198th Battalion, Canadian Expeditionary Forces] that we would leave Friday. Great was the rejoicing. Wednesday will be our last free day. Home for dinner. Down town and bought a Vanity Case for Isobel… To Isobel’s for supper. We went out for a walk. A very mild night. ‘(Sunday) Isobel and I went to church and heard a good sermon. Left about 11.45 and came back to camp. Our time grows shorter. ‘(Monday) Isobel was in for supper and the evening… One hears nothing these days but our departure. We are beginning to realise that we are going. ‘(Tuesday) Isobel and I went to Shea’s in evening and saw a dandy show…Went home from Isobel’s and had a good bed. Rather tired and could not sleep for a time. ‘(Thursday) In camp. Visitors allowed in. Father and mother, Evelyn Minnie and Hubbie, Rubie and Isobel down. Two bright spots in our good-bye. Mother acted like a trump and we parted all serene. Saw Ben Cameron’s aunts. The friendship between Isobel and I entered on a stage, at least from my viewpoint and feeling. He is among two thousand troops who board The Metagama in Halifax bound for Liverpool. Even before they leave they suffer their first casualty. They watch as other boats set sail for England. ‘We were peacefully eating our supper when the “Lapland” steamed slowly down the harbour past us. We lost no time in finishing our meal and getting out on the deck. The “Southland”, with decks lined with troops and bands playing, passed soon after. They cheered and we answered heartily. About 5.15 we began to turn our nose towards the sea and then we knew we were off. On 25 February, 1917, the S.S. Laconia, sailing from New York to England, was sunk off the coast of Ireland, with the loss of twelve lives. Among its passengers was Floyd Gibbons, the soon-to-be famed headline hunter and war reporter of the Chicago Tribune. His published account of the sinking of the Laconia helped change America’s isolationist sentiment and pushed it into the declaration of war against Germany that would follow in less than two months. Bob’s letter continues: ‘Henry Pope was in one of the reading rooms when the torpedo struck the stern about ten o’clock on a Sunday evening. He went to his cabin, got his overcoat (he was a civilian then) and went to the lifeboat assigned him. They loaded it and commenced to lower it when one of the other boats got beneath theirs and the boat was stopped until the one beneath got clear. When they recommenced lowering, the ropes fouled and one end refused to move, with the result that the boat gradually tilted and the men began to gradually drop off. When Henry saw this he took hold of a rope and climbed about forty feet onto the deck. He went over the whole deck and the only one left was an old sailor who had decided to go down with the liner. Henry persuaded him to come along and they both looked for some means of saving themselves. ‘Wednesday we carried on with a new part of our training – movie acting… We fell in at 8.30 in full marching order and proceeded down the Portsmouth Road when we were photographed by the movie man as we swung along (Scene I). Then we halted, while the scene changed. ‘We then stopped for dinner and waited while the scenery was arranged for the next act. We went back to the Trench area. ‘The scene: a low ridge to the North: an intervening space of four hundred yards and a high ridge to the South. ‘The actors: The Germans (Buffs behind the North ridge and wearing hats reversed and advancing in mass formation): the British (the remainder of the Brigade advancing on us in waves). ‘The action: About thirty mines; gas bombs, smoke bombs – everything that made smoke. ‘The spectators: half the countryside; Griffiths (the producer of “The Birth of a Nation” and the one we were assisting in), Lillian Gish, the leading lady in the aforementioned movie. ‘What’s the use of worrying? He describes the scene in the camp as 1918 begins: ‘Very few went to bed before the New Year came in. At 11.55 pm, December 31, 1917, the bugle band sounded the Last Post, ushering out the Old Year; and at 12.01am, January 1, 1918, they played Reveille to awaken the New Year. Then, after exchanging best wishes amongst the boys of the section we crawled under the sheets. ‘I don’t want you to begin worrying now that I am going out to do my bit. The majority of my friends and acquaintances who have seen service have gone through it safely and I see no reason why I should be less fortunate. On 8 August, nine days before Bob was posted back to the front, the Canadian Corps, 100,000 strong, attacked the enemy and drove the Germans back a distance of 13 kilometres. Ludendorff described 8 August as ‘the blackest day of the German Army in the history of the war’. He offered his resignation but the Kaiser refused it, though the Kaiser had by then made the decision that ‘the war must be ended’. On 26 August, the 4th Canadian Brigade, including Bob’s unit, took part in the Battle for Arras, at the northern edge of the Somme salient. The assault was launched at 3 am and the 4th Brigade moved rapidly through the enemy’s outpost zone and reached the outskirts of Guemappe where they came under heavy shelling. At an unknown hour, somewhere between Guemappe and Monchy, Bob was wounded again and removed to a casualty clearing station. In three days of fighting the 2nd and 3rd Divisions lost 254 officers and 5,547 other ranks. After his death, three more letters arrived, his last to his sister Veny [Evelyn], dated 22 August: ‘It is a scorching hot day, but I am thankful to say that I am stretched out on the grass “in the shade of the old apple tree”. There is a faint breeze blowing at times, and it is much enjoyed I assure you. He never got to write that letter. Bob Conklin, along with 632 Commonwealth soldiers and 46 German soldiers, is buried in Ligny-St. Flochel cemetery, France. Five weeks after his death Germany sent out her first peace note and World War One ended with the armistice on the eleventh hour of the eleventh day of the eleventh month, 1918. CONKLIN – Sacred to the memory of Pte. R.J.D. Conklin, who enlisted with the 201st Battalion and was transferred to 198th Buffs Battalion, died Aug. 29th, 1918, at Battle of Arras, buried at Ligny St. Flochel. And then, up there, we’ll understand. Were over many a cherished plan. ’Tis then, up there, we’ll understand. In 1919 Bob’s fiancée, Isobel, broken-hearted since his death some months earlier, but continuing her work as a nurse, perished in the ‘Spanish’ influenza epidemic that killed 50,000 Canadians and millions worldwide.